Heat a tbsp of oil in a wok to sizzling hot. Add finely chopped ginger and garlic. Immediately add chopped bell peppers, green beans, mushrooms and carrot. Saute it at high flame for about 30 seconds. Now add chopped cabbage, spring onion and bean sprouts and add all sauces, salt and pepper and saute it on high heat for a minute or two. Make sure that the vegetables remain crisp and crunchy. Prepare thick Corn Flour Paste adding little water and keep it aside. Place a tablespoon of the filling across the end of a wrapper, leaving a border of 1 inch on each side. Start rolling up the wrapper and when you get to 3/4 of the way , fold over the edges to enclose the filling. Brush the remaining wrapper with a Corn Flour Paste and seal the edges. Repeat this process with all the wrappers and refrigerate these rolls till needed. Heat the oil in frying pan and deep fry the spring rolls, a few at a time, until golden and cooked through. Drain on kitchen towel and keep warm whilst you fry the rest of the rolls. Serve immediately with a dipping sauce. Now coming to Dipping Sauce. I make this basic dipping sauce which is quick to make and perfect to serve with spring rolls or to use as a sauce for stir-fries. Combine all ingredients in small saucepan and simmer for 3-5 minutes, stirring, until sugar dissolves and corn starch is well mixed. Nice that you commented on my site, else I would have not visited your WONDERFUL blog. Great job and I am astonished about your effort. You have a lovely blog with beautiful pictures and yummy recipes Sia ! 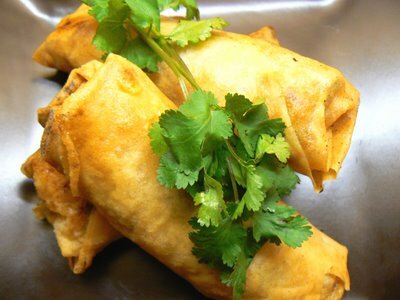 And these spring rolls looks perfect !! 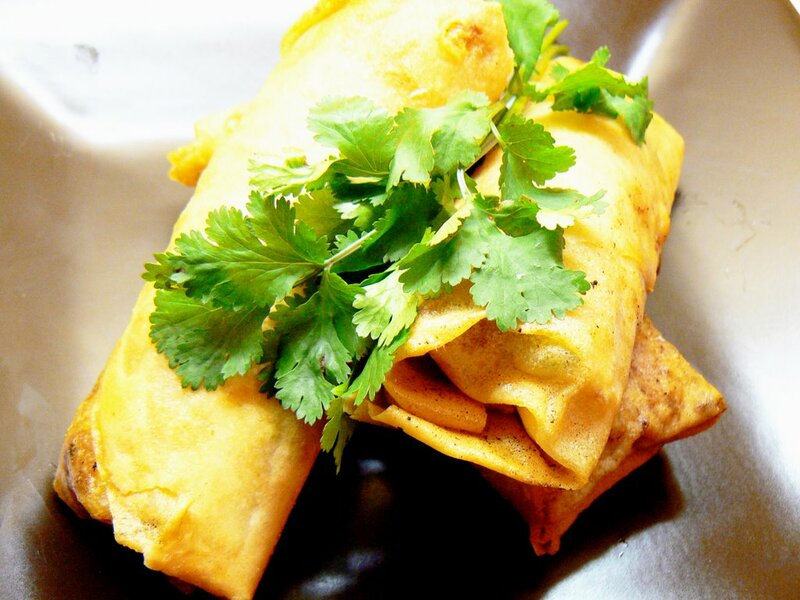 Supriya,Love spring rolls.I used to make these a lot when I was in the US.That was before I had my little princess..My mouth waters at the beautifully presented spring rolls.Will try your recipe when I get spring roll wrappers next time..
Oooh! I love spring rolls too! Never tried making at home but buy! :)) My post have that too but store bought! Good one, Sia! Lovely...I love this with Ching's Hot sauce. Great pics Sia..and thanks for visiting..hope you do try the coffee face scrub...you'll glow! its a mouth watering receipe.I will surely make it on coming weekend can u please tell me where i can get spring roll wrapper. u will find these wrappers in frozen section of supermarkets. check them in indian frozen sections. Thanks for this recipe I tried it out last week and it came out so tasty that we ate it all up in a jiffy! I also tried your Pineapple menaskai some time back, I loved it. Thanks. I love your site and its look. how to prepare wrap? you gave half way to sping roll, i can not buy wrap out side. next time please give full receipe. thank u so much for letting me know. i know spring rolls are hard to resist;) if you are not very fond of deep fried stuff then u can just stuff the vegetables in thin rice wraps and serve. menaskai is all time fav recipe in our home too:) i am glad to know u loved both the dishes. back in india i used to prepare these wraps using 1:1 ratio of maida and chapati atta with 1 tsp of cooking soda. make a stiff dough like chapati and roll it into very thin roties. place the stuffing in the center and stick it using a thin paste of maida and deep fry. 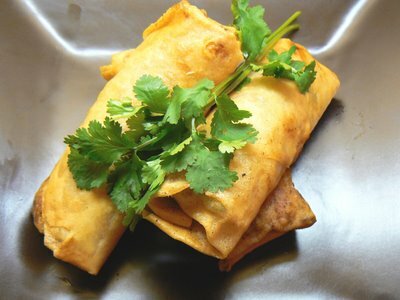 now a days spring roll wrappers which are very thin rice wraps are available in most of the supermarkets. i am sure you should be able to find them somewhere because there is vast difference in taste coz of wrappers. Hi, They look wonderful. I happened to visit your site today. About the spring rolls, can you clarify when to brush the rolls with corn flour paste? I was not clear how you closed the rolls completely too. I will try these. wanted to know :is corn starch different from cornflour?can i use cornflour to make the dipping sauce? hi sia,only i visited ur blog.i book marked it.didnot prepared anything yet.but all recipes looks yummy..i have kids..5 year and 15 month..i want to try this one first.let me see when i can prepare.wonderful blog. only i visited ur blog.i book marked it.didnot prepared anything yet.but all recipes looks yummy..i have kids..5 year and 15 month..i want to try this one first.let me see when i can prepare.